Working on the Green Fins initiative means working closely with the diving and snorkelling community. Over the last two years, I have been privileged enough to meet some of the industry's strongest forces for coral reef protection. 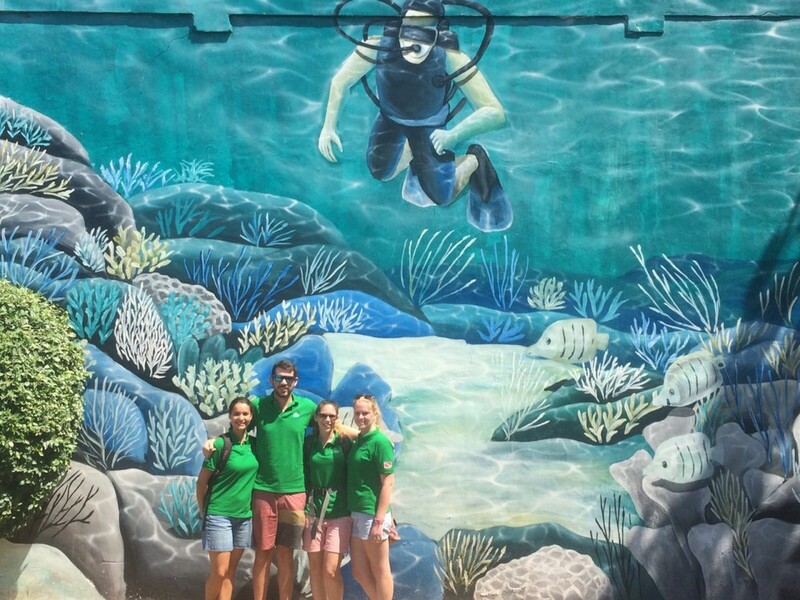 Whether it's the Green Fins Ambassadors - local dive guides going the extra mile to promote sustainable diving practices - or dive shop managers working alongside government to achieve their mutual conservation goals. These individuals come from all walks of life: mothers and fathers, twenty-somethings and fifty-somethings, Filipino and Chinese, experienced divers and even newly qualified divers. But they all have one thing in common. They love the ocean. They'll do everything they can to fight for the survival of coral reefs. One way in which Reef-World are working to help these inspirational people is by breaking barriers throughout the industry. Recently, so many instructors and dive guides have expressed their concerns about the growing number of new divers visiting them from China. I have heard story after story about divers that don't know how to control their buoyancy, divers that have been certified without even entering the ocean, and divers that just want to touch e.v.e.r.y.t.h.i.n.g. Chinese divers are becoming burdened with the stigma of being terrible divers before they've even set foot in a dive shop. It's a sheer numbers game. In 2017, visitors from North East Asia accounted for 65% of all people travelling to the Asia pacific! That's a huge majority but such growth only really began in the last 4 or 5 years. That volume of people learning a completely new sport - diving - in a completely new environment - underwater - that quickly is bound to lead to problems. Again and again the industry has identified language barriers as the biggest hurdle to helping these new divers learn about sustainable diving and coral reef protection. That's why we at Reef-World have really pushed to translate all of the Green Fins materials into Simplified and Traditional Chinese (as well as Japanese and Korean!). By using these materials, dive guides and instructors can break the language barrier between themselves and their divers. They are able to show them exactly how all divers should behave underwater to ensure the future survival of the animals they love. I meet and work with passionate individuals from all over the World. And finally, I get to do all of this standing beside the 1 person in the World whom simultaneously makes me feel completely content, yet inspires me to achieve the impossible. Don’t get me wrong. There are still difficult days. Hell, there are difficult months! There are seemingly endless hours stuck in front of a computer, questioning whether something is even possible! But the difficulties and the frustrations never outweigh the positives. The take home feeling is always one of satisfaction...of achievement...of passion for my job - for my life! And that is why I cannot wait for my internship with The Reef-World Foundation to end…and for my job with them to begin!